Sorry for being so late with yesterdayís update. We had our report ready at 11.30 p.m., rushed out of the hotel and looked out for the closest ISDN public telephone. After walking through some very narrow streets we found ourselves in the amusement area of Sendai. In front of us the gray phone - so we rushed into the booth. A few people were standing around the telephone booth. 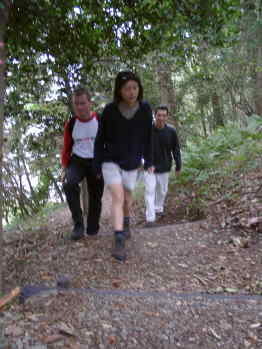 For the first time in Japan we had a funny feeling about the environment we were in. But we unpacked our notebook and started to get the internet connection. As we were working, we felt shadows of the underground observing us. The first trial: Password was not accepted. Shoot, try once again but unsuccessful again. The third trial with another phone number: Connection unsuccessful. While we were trying hard to get the reports out to the net, a foreigner (in Japan, anybody who does not have the feature of Hiroe.) came up towards us: now what do we do? He sticked his hand in his bag - big PANIC written all over our faces and it was getting bigger by the seconds. Sven quickly hid the notebook - the guy simply started to put colorful small papers on the outside glass of the phone booth. After he covered half of the glass portion of the phone booth with his colorful papers he disappeared into the darkness. We quickly left the phone booth and stared at the art that was just completed by the guy: Photos of minimally dressed girls with large bold phone numbers. Now we saw that every street corner was filled with such papers. There were no spaces that were left empty and they managed to do this within 15 Minutes (this must have been around 2000 pieces). In order to spare us from putting ourselves in an uncomfortable situation we did not take any photos of this scene, so unfortunately only text but we are sure you can imagine this. In the next morning, we packed our stuff and started to head to the next city as we have been doing since almost a week. 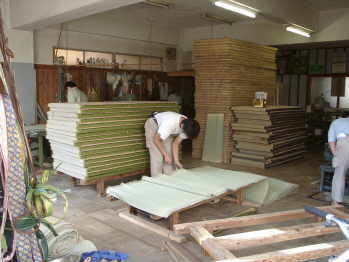 On the way to the station we came across to this Tatami-manufacturer. Finally we were able to see how the matts, on which we have been sleeping in last few days, were made. Almost all processes are manual work. Such manufacturer as this one belong to a rather large operation. So such Tatami-Mats costs starting 20.000 Yen (ca. 400,- DM) and as anything else in Japan there is no limit to how high it could get. From the train station it took us some 50 minutes to go with the regional JR-train to Matsushima. This village is located at the pacific coastline and is very well known as a fisher village. The appr. 260 small islands off the coastline are scattered in the ocean and reminded us of Thailand a lot. In this region we recognized a lot of caves dug in the rock formations, a lot of them containing buddhist statues decorated with colorfull clothes, flowers or coins. This view also didn`t really fit into our picture of Japan so far. This overgrown stairs we would have rather expected in a South American rain forest at an old gravesite of the Inkas. Matsushima has many different faces, adding new points to the picture of Japan we had encountered so far. This 252 m long bridge connects the island Fukuurajima with the mainland and is the only toll-bridge for pedestrians we got to know so far. The 200 Yen (some 2.- US-$) per person were well worth it though. 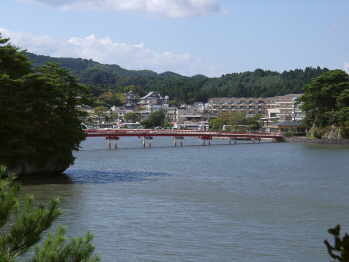 From the island you have a very nice panoramic view over the whole bay of Matsushima. Therefore we skipped the boat trip in the bay area and saved the 1,400 Yen (some 14.- US-$ per person). 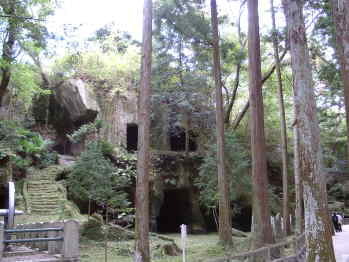 The island of Fukuurajima is a natural botanical garden with more than 250 different species of plants and in its natural beauty a huge contrast to the `styled` gardens of Kanazawa some days ago. 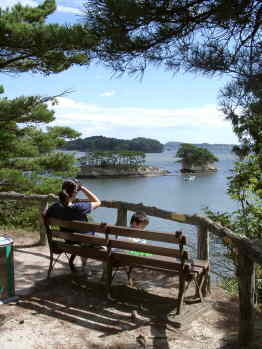 We had great fun discovering the island in the shadow of the trees and agreed that the trip to Matsushima was well worth the effort. A special thanks to the information center which does a very good job taking care of the visitors over there. Even a group of volunteers is available to guide interested visitors through city and bay area. Unfortunately we didn`t have enough time to take advantage of this offer. After we started being hungry again from so much walking we stopped at a small restaurant. Two noodle soups with tempura, a chinese noodle soup and barbecued beef. 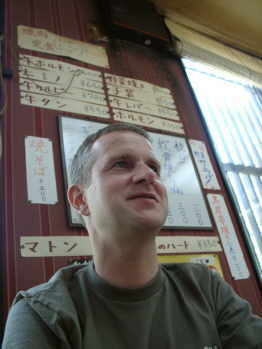 In traditional restaurants in Japan the menue very often is placed written on single sheets of paper placed on the walls. The guest has to scann a full 360 degrees to get the full offer of dishes. Here you see Sven with some of todays specials. After our order was placed Mr. and Mrs. Kitajo got to work. In their small kitchen they cooked, boiled and deep fried our dishes exclusively from fresh ingredients. 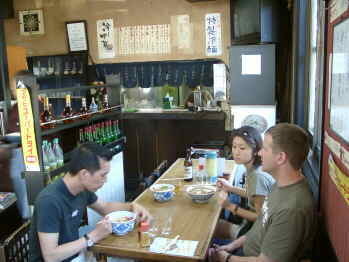 The three soups and noodle dishes were ready after just 15 minutes. Then Sven was aked to have a seat at the table next to us. `You will need more space` said Mr. Kitajo very determined. Then he put the small charcoal grill on the table. The meat had to be grilled at the table, but was so thin that it only took a few moments till it was done. 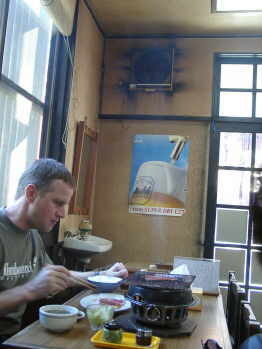 This dish must be quite popular as the walls of the room appeared to have been smoked by cooking fumes many times before.The discoloring around the fan had a charcoaleish colour but gave the restaurant `Taishoie` its individual charme. The dishes were all very delicious and also one of the cheapest warm meals we had eaten on this tour. 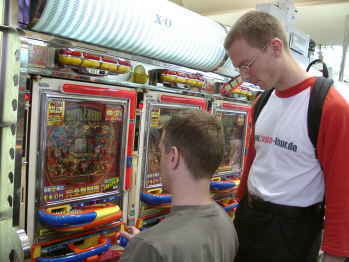 At the stopover in Sendai we fullfilled a long awaited wish of ours: we played Pachinko. Although we passed these gambling places with an amazing noise polution up to the street quite often already we never dared going into one of these places so far. Now the four of us went ahead and crossed the doorstep behind the fake flower bouquets and the colourfull advertising-flags. Inside we were welcomed by an deafening noise - not just from the uncountable number of small metall balls but also from loud rock music. 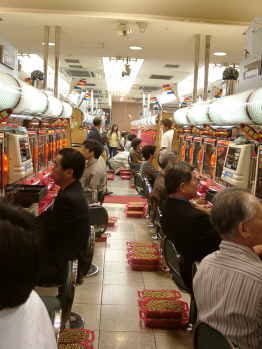 In long rows the gamblers were sitting in front of their Pachinko-machines side by side and stared in suspense on the small balls which should bring them fortune. Close to their feet there were up to four or five small plastic containers filled with the metall balls. 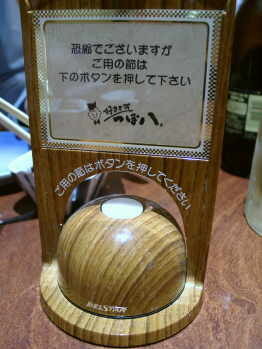 After we had understood briefly the concept of playing we also wanted to try it ourselves, 1,000 Yen (appr. 10 US-$) we had to pay as a minimum starting amount. We got a plastic card for this amount which we had to insert into a Pachinko machine. After a short and noisy 5 minutes our feeder was empty and all the money gone. We left the `gambling-hall` with buzzing heads and cigarette smell in our clothes. On the way out we saw the potential rewards for winning consisting of leather bags, watches and many more precious things. As it is forbidden here to play for money the winners get these objects instead. 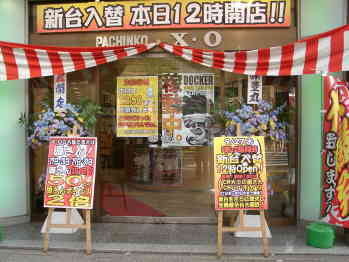 (We heard though that there is a kind of pawn shop very close to the Pachinko place that exchanges the goods for real Yen.) Very clever we thought. 7) What is the object on the photo ?